This week's Tuesdays with Dorie recipe was chosen by Sabrina, of the refreshingly summery blog Superfluous. The original recipe is actually for a cranberry upside-down cake, but Dorie kindly included a fruitier alternative for those of us who are not quite ready to step completely into Autumn. I should love cranberries. They're tart, perky, and versatile. Yet for some reason I'm not really a fan, and I have no valid reason. So, for this recipe I had no qualms about opting for the suggested peaches, or in this case, nectarines. This cake is the perfect way to savor the last bits and bites that summer has to offer. The recipe is quite simple. You spread the chosen fruit over a layer of sugar and melted butter, which to me is truly the nectar of the Gods. The cake batter is placed on top of the divine substance and baked to perfection. I've only made an upside-down cake once before this one and I remember pacing back and forth like a caged animal worrying about the flip-over. By now I should know that Dorie's instructions are, *knock on wood*, fail safe. This cake slid gently out of the pan and onto a too-small yet readily available plate. The cake is wonderfully moist and has the soft spice of cinnamon. When combined with nectarines and blueberries it's the perfect fusion of summer and autumn. The two seasons seep into each other with grace and generosity. If only winter were so kind as to do the same. For the recipe, please visit Sabrina's blog. If you decide to use peaches or nectarines, simply omit the nuts and slice the fruit so that it will lay flat inside the pan. But don't be a Debby Downer like me and hesitate over the season and the thought of cranberries, I'm sure their results are just as delicious! I used to really not like cranberries, but now im hooked! Im glad you didnt use them in this recipe though, they may have overpowered the deciduous fruit. This dessert looks sensational! You know how I love my fruit desserts, and your photos are making my mouth water. I've got to try this one! Your cake looks beautiful! Yes, any summer fruit would be a hit with this recipe. I was worried about the flip over too:) I just went for it! Your cake looks so tasty!! Great choice of fruit. Beautiful dessert. Cranberries were excellent. your variation sounds fantastic! looks great too! 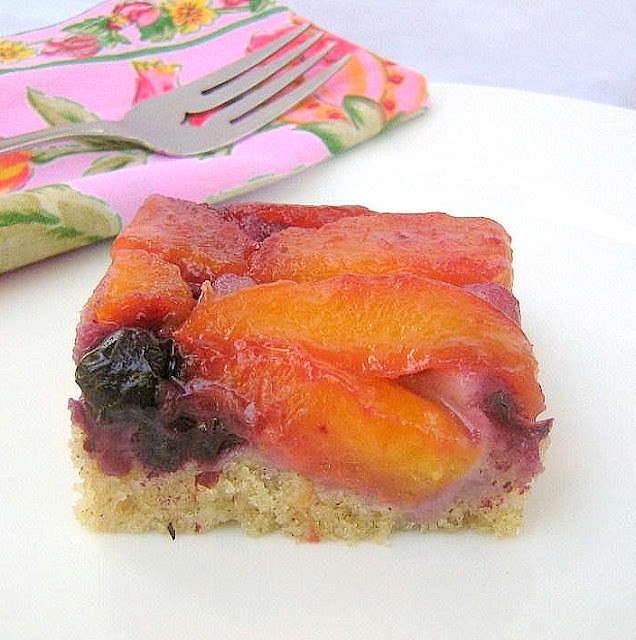 I can imagine how delicious this cake would be with nectarines. Gorgeous! the fuzzy skin on a peach, but chalk board and nails doesn't bother me?! Mmm, perfect looking slice of cake there. Cara Valerie, I love your cake slice, it's delicious !! I would love to bake with you !!! This is beautiful, Valerie. I also love the lime/lemon bars below. This looks wonderful with the combination of fruit, and I love the square pieces. I'm not a big fan of cranberries either, as you know, rhubarb is my fave tart fruit! I must say, I think of you every time I post a rhubarb recipe and can imagine you rolling your eyes! Just made your Black/White PB Brownies...ENORMOUS hit is an understatement. 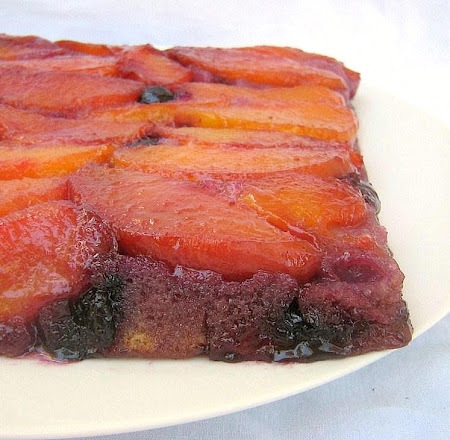 Wanted to make this cake but a bit unsure on the nectarine/berry amounts. I am baking neophyte. Another understatement. Could you give me an idea of how much fruit you used? thank you so much - your blog is beautiful and a source of great inspiration!! To answer your question, I believe that I used 3 nectarines (peeled and pitted), and about 1/2 cup of blueberries. It was almost a year ago, so I apologize if I'm off a bit. Arrange the sliced nectarines flat-side down on top of the melted butter, then arrange the blueberries evenly over the slices. It doesn't have to be perfect, just be sure it's as tight as you can get it.